A final-day century from Kent batsman Brendan Nash secured his side a draw against Lancashire. The visitors had an early scalp when Simon Katich (93), who reached 20,000 first-class runs on on day three, was caught off the bowling of Matt Coles when facing his first ball of the day. Coles took Gareth Cross with the next ball, and Lancashire declared on 395-7. Despite being 36-2 in reply, Nash's ton steadied Kent, and the captains shook hands with the visitors on 178-2. "I think we've played very good cricket over the four days. We're delighted that it's the second game running and we've got a lead of over 100. "We are certainly pleased with the way we are playing, and if we had more time, we might have been able to force a result. "Kent played well in their second innings and we never got into position to win the game." "I've had a few starts for the season so it was good to get the rewards, very pleasing. "Normally it takes me a while to get into a season, but I had a different off-season to usual, and so far so good. "The game changed quickly in a few days, they batted well towards the end of their innings. It would have been interesting had that (rain delays) not happened. "We're in good stead, we've got to keep the fight, we've had two good battled and it would be good to keep that going." 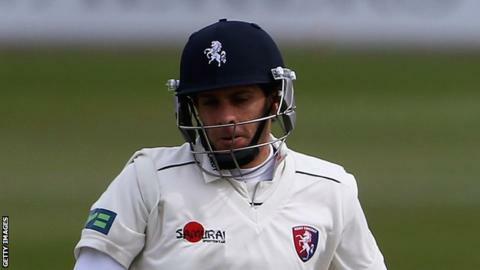 "It was a rain affected but creditable draw - especially for Kent - who showed great resolve to force the draw after Lancashire had racked up a good first innings lead. "Brendan Nash scored his 13th first class century, immediately after which the teams shook hands on the draw. "Nash is yet to score lower than 50 in each of his County Championship innings this season."